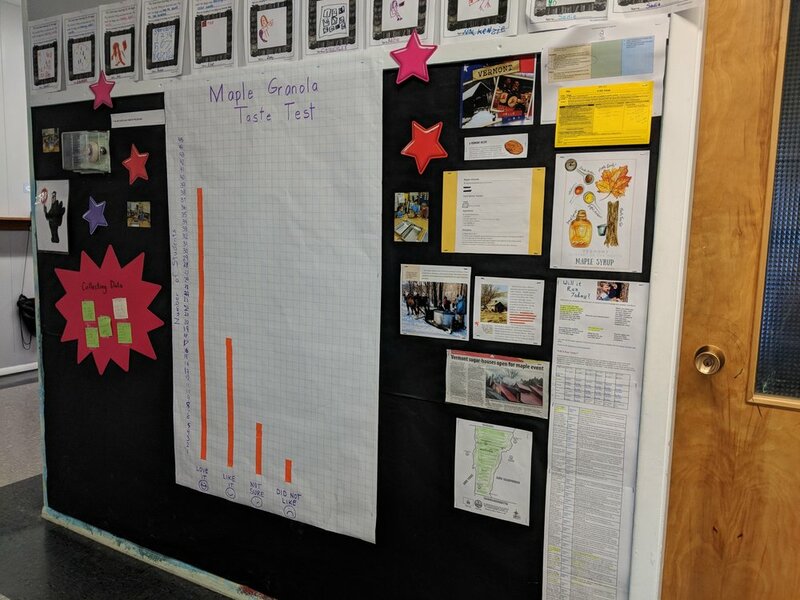 Sunderland Elementary School's Taste Test Program — Northshire Grows Inc.
Sunderland Elementary School educators Hilary French (K) and Charlene Lehmer (3) participated in a VT FEED Farm to School course in Bennington last fall. 25 teachers and staff took advantage of this 18 hour foundational training about the three Cs (classrooms, cafeterias and communities) of Farm to School. With the help and encouragement of Liz Ruffa at Northshire Grows and Ryan Morra at Shelburne Farms and Vermont FEED (Food Education Every Day), Sunderland Elementary School initiated a Farm to School initiative this year. Students in Mrs. Lehmer’s third and fourth grades classes as well as Mrs. French’s kindergarten class prepared foods for the entire school to sample during lunch this school year using Vermont’s Harvest of the Month as a guide. The students graphed the results of those lunchtime taste tests. One of our most popular taste test took place in March. As Vermonters might guess, the harvest of the month for March was maple! We observed the effect of sunlight on the maples trees and especially on the temperatures needed for the sap to run in order to make maple syrup. We also noted the connection maple has to jobs and tourism in Vermont. The kindergartners prepared a large quantity of maple granola for students to rate. Here are the results: thirty-eight kids loved the maple granola, eighteen kids liked it, seven weren’t sure; and three didn’t like our granola recipe. The kindergartners were happy that their maple treat was so well received. Sunderland students enjoyed preparing and tasting their efforts tremendously this school year.. We definitely will be cooking again next year! Making Granola with Maple Syrup on a wintry March day! The students surveyed their peers and came to a conclusion: They loved the Maple Granola! Older PostCelebrate Pownal's Agricultural Assets this Summer!